Always wanted a gravestone in your yard but just couldn't commit to the expense? This 22 Inch Foam Tombstone decoration is a great way to test drive what it will look like. Simply prop one or a couple up in your yard, and if you like the look go ahead and get a stone one. Or just use these as holiday decorations. That works, too! Sure, a big zombie with electronic red eyes would be scary... but you're more about the subtle frights. You like the thrills and chills... the ambiance and atmosphere! That's why you're the kind of person who would love this tombstone decoration. It looks old, it looks creepy, and it says RIP, the universal phrase that means something died. One you put a few of these on your lawn, everyone coming up your step will walk a little slower, their head will swing from side to side, their eyes will be a little bit wider, waiting for something to jump out and get them. The mailman might not appreciate your new and scarier front yard, but the kids are gonna love it. 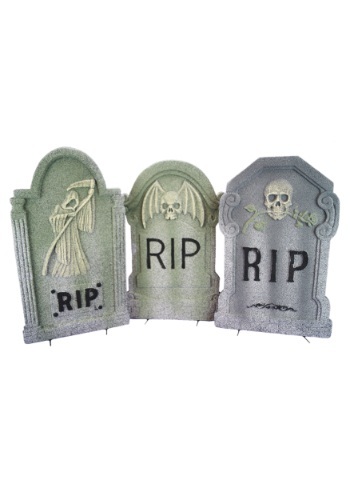 It'll look like your yard has turned into a graveyard when you have this tombstone decoration set up in your lawn. The top cross portion fits into a slot on the top of the body to assemble the full stone. Want people to think you have some dead bodies in your yard? This 36" Two Piece RIP Tombstone is a creepy decoration that might make people believe that. It's easy to assemble and set up--just insert the stakes into the bottom of the tombstone and then into the ground. If you need people to think dead bodies are buried in your yard for your next party, then this graveyard decoration is going to blow your mind. It's got skeletons and everything. Muahaha... Your neighborhood won't know what to expect when your yard turns into a pop up grave yard. Sure, they're going to think that you're just decorating for Halloween, but if you outfit your scene with the right pieces, they just might suspect that you have something more diabolical going on. 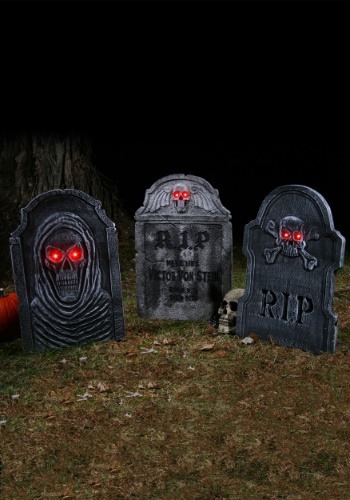 Start your scene with this tombstone set to make your yard the most frightening! How can you tell when a graveyard has been abandoned? One clue is that the gravestones are crooked, cracked & weathered. Nobody has cared for them in a long time. This Crooked Stone Tombstone Set perfectly captures the ambiance of an abandoned, haunted cemetery. Put this frightening decoration in your yard, and it will be the first step in assembling your own graveyard. After all when the undead rise, you might as well have your house be the first stop, right? One of the spookiest places around is a graveyard. 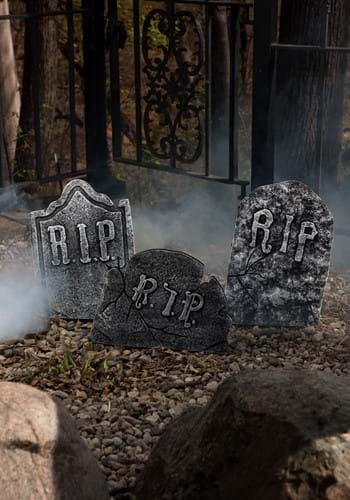 So if you want to give your yard a haunted look, this Deluxe Tombstone Set is just what you need! Each of the 4 foam tombstones has its own design, and they come with plastic ground stakes. Then add a Grim Reaper figure and hang a ghost or two in a tree, and your yard will be the haunted attraction of the neighborhood! A common misconception about this tombstone decoration, is that you have to have dead bodies in your lawn in order to use. You can plant it in your yard whether or not your lawn is a cemetery. If there's one thing that's always scary it's a cemetery. Most grave markers are pretty classy, nice engraving, says the name of the deceased, a quote or verse; real nice. That's probably not what comes to mind when you think of a spooky graveyard. You probably picture something more like this RIP Tombstone with Skulls! This is the real deal, something right out of your nightmares. Spread these across your lawn or use them indoors, it's up to you! Just don't be surprised if you have some trick-or-treaters who choose to run across your yard at record speed. When someone leaves this world, they usually get a grave marker, but you rarely see one quite as creepy as this! Our Slanted Cross Marker is so scary, you might find some people avoiding your lawn altogether. 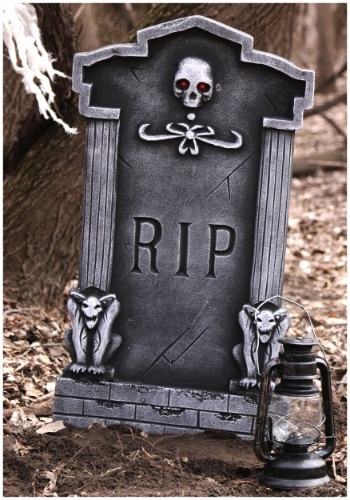 Unfortunately, those pesky dogs couldn't care less... but the trick-or-treaters who come to your house this Halloween will need a n extra dose of courage to cross grave markers such as this one! Do you need to mark the bodies of the dead in your yard? 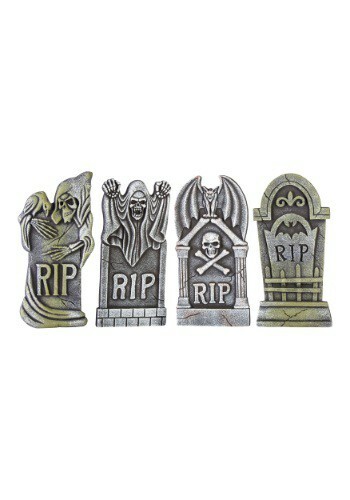 This tombstone set includes three tombstone decorations to turn your yard into a graveyard. They measure from 18 1/2" to 21 1/2" and feature etched phrases like "RIP" and "Rest in Peace" on the front. Scary skulls decorate the front as well. Each of them are made out of a foam material and are painted grey and black to look like aged stone. 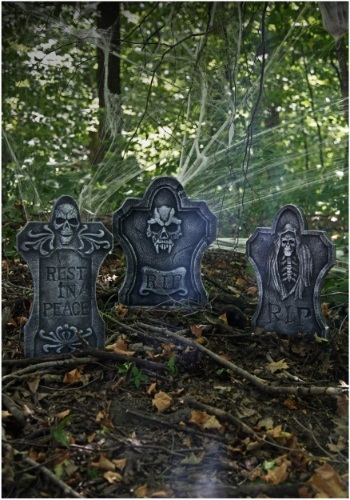 Your yard will become the site of a mass haunting when you place these scary decorations in the yard.